Repeatable through the breech that returns creatures to hand rather than sacrificing or exiling them? Where's my emrakul when I need one? 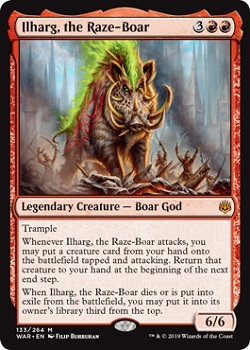 The Big Bad Boar is here at last! It's cheaper to cast than the Forerunners of it's coming?! I'm looking forward to this set a lot. Not just a carrier, a spaceship. "I thought that they were angels, but much to my surprise, they climbed aboard their starship and headed for the skies." Shaw DeYoung, Dimir Boatman.